and opened the bidding 1H. My RHO passed, I bid 1NT, and my LHO bid 2S, which was passed out. It made on the nose and we went -110. After the hand, I told partner that I would have made a takeout double with her hand. She said that she didn't think that our side had a fit. Stop! Time for some very easy math. How many spades do I have? Well, I bypassed 1S to bid 1NT. So I shouldn't have more than three. Next, how many non-spades do I have? At least ten. Can you arrange those ten cards into three suits in any manner in which we don't have at least an eight-card fit? Well, three spades (from the auction), two hearts (giving us only a seven-card fit there), four diamonds (giving us only a seven-card fit there), three clubs (only seven there)... that leaves one card left over. We have to have an eight-card fit somewhere! In fact, we can generalize this further. If the opponents have a nine-card fit, that gives us four cards in that suit out of our twenty-six total. Twenty-two cards are left for the other three suits. So our fits in those suits are, if the hands fit as poorly as possible, are 8, 7, 7! If they have an eight-card fit, that gives us five there and twenty-one in the other three. The worst possible case is that the other three suits split 7-7-7. It's much more likely that we have an eight-card fit or longer, though. Long story short: If the opponents have a nine-card fit, we definitely have an eight-card or longer fit. If they only have an eight-card fit,we probably have one too. Compete! Making 7 easily on the trump finesse and hearts coming home. Only three of 22 pairs bid this 26 HCP slam. We were defending 2H in the East. Pat started things off with a low diamond to the ace. Declarer led a club to Pat's ace. She laid down the king of diamonds and played a third round, ruffed by declarer. East now played a club to the board to play a heart to the jack. Pat won with the king and pushed her deuce of diamonds through dummy. I ruffed with my lone queen of hearts, declarer overruffed, and Pat now had four trump tricks to go with her ace of clubs and king of diamonds for +100! Well done. I'm in the airport at the moment waiting to head off to the Toronto Regional. If you're there, come over and say hi! Last night, I was practicing bidding with my partner Garth. Garth and I are playing several upcoming tournaments, and we have a very complicated bidding system, so we want our agreements to be in tip-top shape for our first big test-- Gatlinburg in just over a week. We've been practicing several hours a week, and getting better every time. This hand came up as the last one of the session. I was very amused to notice that game was most likely on in all five strains - these hands will probably make 3NT, 4H, 4S, 5C, and 5D! I've been experimenting with the E-W hands a bit, trying to see if I can make a full hand where N-S can make game in all five strains but can't make slam in any of them. I've come close, but it seems like 6C by South is always making. Can you come up with a better construction than I did? Things are going well so far at the Portland Regional. Meg and I won Bracket 2 of the Monday-Tuesday KO with friends from Vancouver, BC, and we placed 3rd in the Wednesday Open Pairs. We start a new KO this afternoon. If you're around, please come check out my lecture this evening starting at 6:15 in the main playing area. I'll write up some of the more fun hands of the week when I get some time. Last week I found myself playing against the current ACBL President, Jerry Fleming, and a former ACBL President, Sharon Fairchild. Sharon and I had a game together two years ago, right after she started her one-year term, so I knew she was a sharp cookie. I hadn't played against Jerry enough to know much about his game. Jerry, on my left, led a fourth-best five of diamonds. I played the six of diamonds off the board, and was pleased to see it hold. I played off three rounds of hearts to see if my luck was in there too-- and it was! They split 3-3. 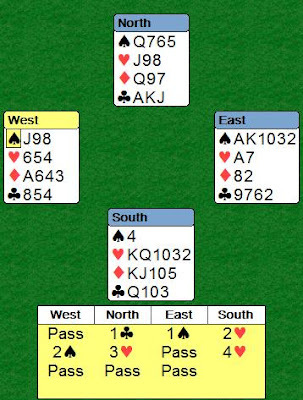 Rather than figure out what to pitch on the next two hearts, I decided to leave them on the table with the spade ace to get to them later. Since anything that LHO led would be good for me, I led the jack of diamonds off the table (Sharon, East, pitching a discouraging club). West won and led the jack of spades, which ran around to my queen (Sharon playing the three smoothly). I pounded out the last diamond honor and West put another spade on the table. I could stick in the ten and take a whole lot of tricks if LHO had led from KJx or KJxx, as it appeared... would Sharon have made the good play of ducking from Kxx or Kxxx? I said, "I'm making this play out of respect for you, Sharon," and hopped up with the ace of spades. I made exactly two. A great smooth duck from Sharon. When did we let expert players go into bridge politics, anyway? Bill Pollack, President of the United States Bridge Federation, has sent out a plea to Juniors and former Juniors to help the USBF out in recruiting for the upcoming World Transnational Junior Championship in Turkey and for other Junior events. You can read his press release here. The Junior programs in North America are dying. Please do anything you can to help. By the way-- he mentions to contact him several times in his press release, but nowhere does he say how to contact him. Check out the USBF's Contacts page here.